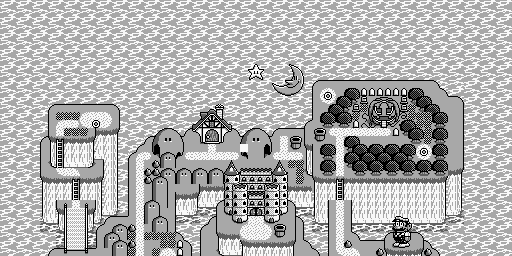 Super Mario Land 2 introduces the concept of space exploration to the Mario series. Also, Wario. Graphics from earlier versions of the game still survive in the ROM. While largely identical to the final Mario tileset, there are some differences, mostly relating to poses of Mario from the front. The fireball is also much darker. These graphics are only present in the Japanese version; they were replaced with duplicate title screen tiles in the American and European versions. The early font is not shaded at all, and most of the digits have different graphics. The final version frees up some of the letter tiles for other graphics, like the money bag. The B isn't used in either version. Found in an early version of the font, this would have been used to indicate time instead of the "T". It was probably shortened to make the HUD less cramped, and an early screenshot indicates that this was changed before the GOAL was. The last two 8×8 tiles were replaced with the money bag graphics. The horizontal pipes were made a bit thicker in the final version, probably to hide Mario when he travels through. A thicker version of the floating platforms found throughout the game. Another variant of the early platform above that looks as though it's dissolving. Animations of Mario swimming in space. It's possible these were meant for the last Space Zone stage, where you have free vertical movement. These animations aren't used either. There are no vertical pipes in Space Zone, and you can't spin jump. The trampoline from Super Mario World! This appears in an early version of the standard block tileset. In the final block tileset, it was replaced by the fire block graphics. Graphics from an older version of the GOAL, which include a sign above a mushroom house. While all of the graphics exist (left), only the rooftop has metatiles defined (right). This version of the GOAL appeared in an early screenshot, which also shows the final timer graphic. Interestingly, the ripped tiles differ somewhat from this shot: look at the lower part of the roof by the right side of the doorway, and the area where the pole meets the roof. This may suggest that the old GOAL underwent a tiny bit of alteration before being scrapped. An unused ceiling spike, intended for Space Zone. These tiles are found with the rest of the castle overworld graphics. The top of the castle is always obscured by a large black cloud, even after you defeat Wario, rendering them unused. A tree to the right of the Pumpkin Zone entrance is in a different location, and is also missing a tile. For reasons unknown, some water tiles next to Macro Zone's right chimney were switched around. The small end of the tunnel to the right of Macro Zone has a blank tile above it. At one point, this probably had a different tile, as it reuses a tile from elsewhere (the left side of the small column things with eyes) in the final version. Since the flowers(?) northeast of the castle are replaced by the dark cloud in the final version, a single set of flowers was added to the right of the tunnel mentioned above. A piece of the fence(?) southwest of the castle is missing. This might suggest that the fence posts once formed a vertical line instead of a bracket shape. The last 8×8 tile of the Pumpkin Zone graphic is unused, cut off by tree tiles. Along with whatever those other four tiles are supposed to be, an unused H can be found. This suggests that Macro Zone's name originally began with an H (Home? House? Huge?) but was changed sometime in development. A static version of the flower tiles. In the final version, the flowers in the background (that appear when the Tree Zone secret level is cleared) are animated. How this would have looked in-game. These strange eyes appear with the rest of the Tree Zone object graphics. In an early version of the game, the second level of Tree Zone was actually located inside the tree stump: when Mario stood on it, only these eyes, blinking in the darkness, were visible. To access this location, change memory address A840 to 10 while on the overworld. While you go through this cave to get to Mario's castle, there's no way to actually stop here. Nevertheless, this map location exists, suggesting that there may have been a level here at one point. An inaccessible part of the first Tree Zone stage, containing pipes, blocks, and water, likely a leftover from a much earlier version of the stage. To access this room, change memory address A229 to 54 and A22A to 02, but only above this unused room. There exists an alternate version of the boss battle track that lacks the bass and intro of the used track. "HAPPY" is spelled out in stars in the first Space Zone level. Sadly, there is no way to see this through normal gameplay, although you can reach the Y if you jump up and to the left of the second money bag. It is possible to reach the letters by using the Game Genie code 005-1FE-6E and holding A to moonjump over to the section. This message screen can be found at 0x3288A-0x32ABD, a leftover from an earlier version of the game. The font used for this message only exists in the Japanese version, at 0x149E5-0x14CE4. GameShark code 01209BFF or Game Genie code 200-77B-E6E will display the screen responsible for the message in all versions; unfortunately, the game does not load the associated font data, causing the message to appear glitched. As such, note that this is a mock-up screen. The title screen was completely redesigned for the international release. The sign pointing to the pipe and the pipe itself are no longer there, and the grass was also shortened. A possible debug remnant in Version 1.0 (both Japanese and US/Europe): if you hold certain button combinations on the title screen, you can play the level demos. The game stores input sequences in memory addresses 0xA300-0xA3FF. This part of memory stores 127 input slots, each consisting of two addresses, that keep track of what button was pressed and for how long it was pressed. Pressing one direction and then letting go of it will use up two slots and 256 frames of no input will also use up one slot. The input sequences for the built-in demos are read from this part of memory, but using one of the above codes will let you write new input sequences. However, the game will freeze once all 127 input slots are used. Present in both version 1.0 and 1.1: While going down a pipe, pause and exit by pressing Select. Alternatively, start going down a pipe at the same time you are killed by an enemy. The next time you enter a level, you will go through the ground and can reach areas that are out of bounds. Pause the game at the same time you touch a checkpoint bell in a previously beaten level, then leave the level by pressing Select. If done correctly, next time you enter a level you will hear the bell sound effect and the bell counts as touched so you start at the level's middle when entering it again. If you enter a level that doesn't have a bell (excluding Mario's castle), upon re-entering, you will start at the level's top-left corner at what is presumably (0,0). This was fixed in Version 1.2, which starts you at the beginning of the level as if nothing happened. In the screen where Mario is standing in front of the castle, the flashes from the lightning strikes were toned down in the 3DS version (specifically, there are fewer flashes per lightning strike), likely to reduce the risk of seizures. At the Game Over screen, after 2 minutes and 34 seconds, Totaka's Song can be heard. The game uses two different sets of sprites for Mario, depending on what type of level you're in. The alternate sprites are used in dark levels, while the normal ones are used everywhere else except Space Zone. Some minor fixes were made to the normal sprites before release, mostly to the hat and overalls of Mario's back-facing sprite, which were not carried over to the alternate tileset. Unfortunately, whoever fixed up the back-facing sprite mistakenly used the transparent palette entry instead of the white one, creating "holes" in the sprite. These are much more visible on a Game Boy Color, which can assign separate palettes to sprites and backgrounds. Several other sprites in the game have similar problems (note the blue dots in the Goomba's eyes at the bottom of the screen). This page was last modified on 7 September 2018, at 18:36.